Based on the long-term cooperation with the Oil & Gas industry, the Alfa Laval OF series are specially designed towards the tough industry conditions. Thanks to the internal disc stack along with the efficient centrifugal force, the most challenging oil feeds can be treated with the OF range of separators. This allows our customers to achieve higher production efficiency with low operating costs. The gentle acceleration of the feed keeps the feed droplets or particles intact, which results in superior separation performance, especially when handling emulsions or shear-sensitive particles. The gentle flow conditions and short settling distances help ensure a low hold-up volume and keep the footprint to a minimum. The OF disc stack separators can be installed both on and offshore, either on fixed platforms or on floating vessels. They can be provided as stand-alone units or as complete and customized solutions. The Alfa Laval OF 900 centrifugal separator takes separation to a new level thanks to the innovative design of its flow path. The center-to-center principle ensures gentle acceleration into the high G-force separation environment inside the disc stacks. With this flow path design, Alfa Laval OF 900 uses 30% less power than conventional centrifugal separators. The OF 900 separator are designed and optimized for separation of solids from fluids, such as condensate, oil or water, with specific focus on dangerous contaminants and clarification of MEG. 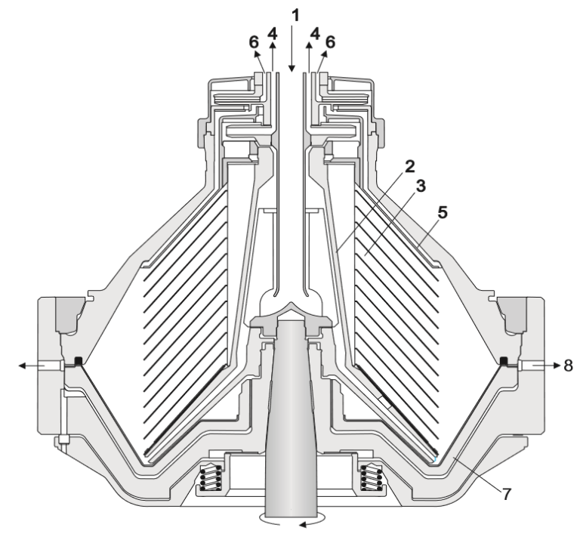 The central bottom feed creates a liquid-filled, low-shear environment. The gentle acceleration of the feed keeps the feed droplets or particles intact, which results in superior separation performance, especially when handling emulsions or shear-sensitive particles. The gentle flow conditions and short settling distances help ensure a low hold-up volume and keep the footprint to a minimum. The gas-tight design of the center-to-center flow fully encloses the process liquid and eliminates the risk of flashing. Want to learn more about OF 900? You can read more about the efficiency, practicality and technical details of the OF 900 centrifugal separator by downloading the Product leaflet. 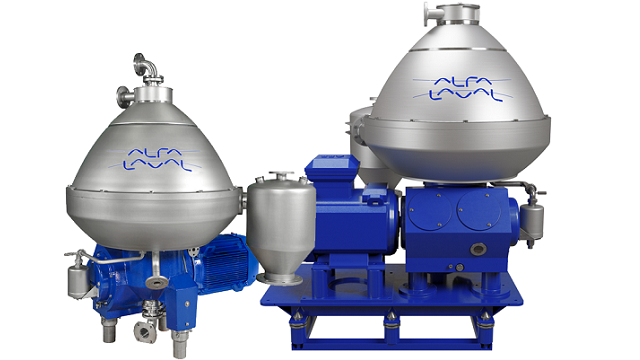 If you are looking for superior separation performance for problem feeds such as oils, water and glycols, contact Alfa Laval today to learn more about our robust and cost efficient solutions. High capacity centrifuge for the Oil & Gas industry. 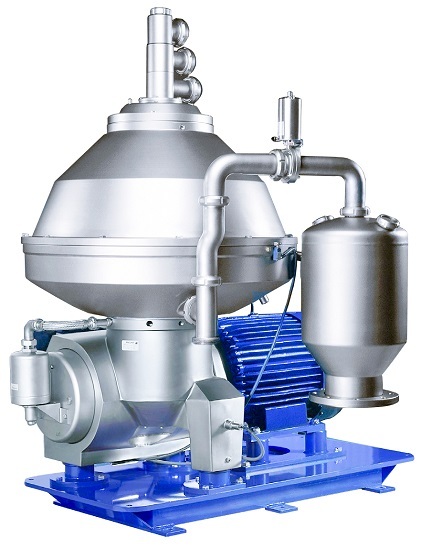 The Alfa Laval disc-stack centrifuge efficiently separates the solid and liquid phases from each other. Traditional settling tanks use gravity to separate phases. 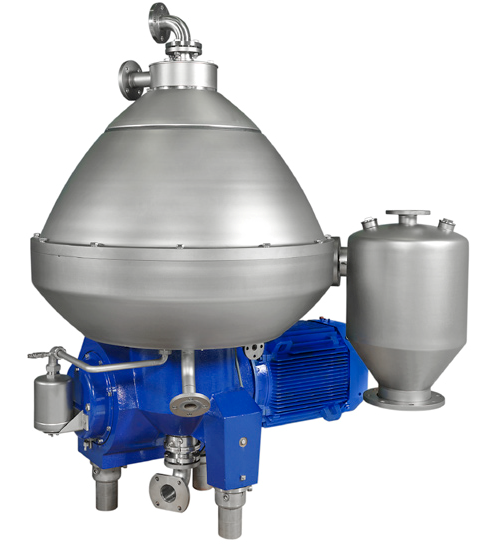 Due to the high rotational velocity, the Alfa Laval centrifuge separators speed up separation by 5,000 times using centrifugal force instead of just gravity. The force presses heavy particles outwards against the separator walls. The disc stack inside the separator bowl ensures lighter particles follow the heavier ones instead of the liquid, making separation more precise and efficient. The feed enters the separator bowl from the bottom via the drive spindle. Separation takes place between the bowl discs where the liquid phase gravitates towards the center of the bowl and the solids move towards the periphery. The gas-tight design of the center-to-center flow fully encloses the process liquid and eliminates the risk of gas flashing. 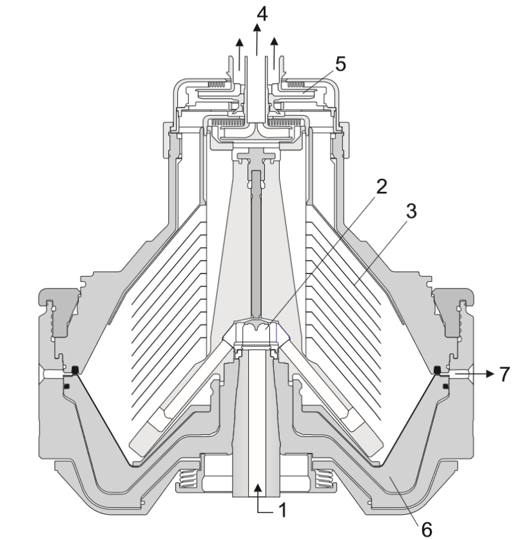 The separated liquid leaves the bowl through the hermetically sealed outlet at the top of the separator and is further boosted by an impeller. The solids are discharged via the discharge ports when the sliding bowl bottom moves downwards. Discharged solids leaves the separator via the sludge cyclone. Typical bowl drawing of a hermetic clarifier unit that separates solids from a liquid without flashing of gas. The feed is introduced into the rotating centrifuge bowl from the bottom via the hollow bowl spindle and accelerated in a distributor before entering the disc stack. The separation takes place between the discs. The light liquid phase moves towards the center of the bowl where it is pumped out under pressure by means of a built-in paring disc. The heavy liquid phase moves towards the periphery, flows over a top disc and is pumped out by means of a paring disc. The heavy solids phase is collected at the periphery of the bowl where it is discharged intermittently via the cyclone. The solids are discharged via the solids ports through the cyclone. Typical semi-hermetic bowl for a solids-ejecting three-phase centrifuge. The feed is introduced into the rotating centrifuge bowl from the top via a stationary inlet pipe and accelerated in a distributor before entering the disc stack. Separation takes place between the discs. The light phase moves towards the center of the bowl, where it is pumped out under pressure by means of a built-in paring disc. The heavy phase moves towards the periphery of the bowl, then along the upper side of the top disc to a paring chamber, from where it is pumped out under pressure by means of a built-in paring disc. The solids phase is collected at the periphery of the bowl, where it is discharged intermittently via the centrifuge cyclone.